One of the most startling and reliable measures of vitality in the contemporary American theatre is the staggering volume and high quality of new plays that it continues to produce. This anthology is offered as a partial reflection of some of the best new work that has been written since 1980. 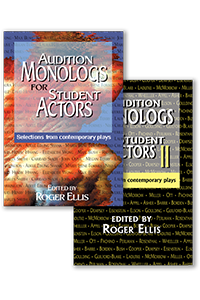 Not found in other published texts, the 57 monologues in this book are all from recently produced plays from both established and emerging new writers and are specifically suited for auditioning. Read more...Selected both because of how well they represent American theatre over the past few decades and because of their suitability for young actors between the ages of 15 and 25, this collection is a wonderful resource for teachers and readers looking for new material not only for audition purposes but also for competitions and studio work. While the themes are primarily those of interest to this age group, the writers and characters embody the diversity of America today. A number of women writers are included here, as well as female characters both young and old, contemporary and historical. In the category of ethnic diversity, you’ll find both writers and characters from Hispanic, African-American, and Asian backgrounds. The works address the major trends and conflicts of today, through revealing glimpses of society as we know it. The monologues in this theatre text are highly original works not found in other published versions. All are from recently produced plays from both established and emerging new writers. The 50 selections are for actors 10 to 24 years of age, suitable for competitive auditions, forensics, oral interpretation, or acting exercises. The monologue collection is divided equally between male and female characters, with a variety of pieces for minority actors. Through the work of 40 contemporary playwrights, these monologues address the major trends and conflicts of society as we know it. A must for any auditioning actor or theatre student.